Package is Vivid 100, I usually get around 70mbps, which I am happy with, since its enough for what I need it for. Streaming, Gaming with decent pings, Youtube, Netflix, the normal stuff. But today I noticed extreme buffering on youtube, so I instantly knew something was wrong, I cant even buffer at 1080p in my native resolution since its so slow. It just does 480p blurry and buffering. 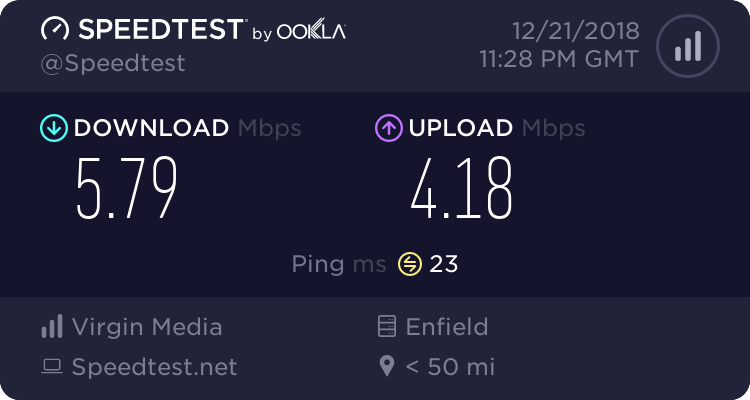 Decided to do a quick test On Ookla / speedtest. Now im getting 5.79mbps. I have done this test Several times All with similar results. Sorry but im afraid thats just not acceptable. I hope this is something thats sorted out very soon. Its the Christmas period and all. Im not quite sure why no one has bothered to reply. Ive been a paying customer since 2008, thats 10 years in a row, and I cant even get a reply for concern on a forum ? My setup isnt "new" or a "new installation", im not a "new customer". I had to join the forums to post this. Im using the HUB 3, for about 1 year now and everything has been fine. Nothing in my hardware setup has changed, regarding connections. I use a PC in my bedroom, with a pair of home plug adaptors since the HUB 3 is downstairs. Regardless, this makes no difference since ive had this current PC setup for the last 6 years with no issues before. If you think it could be something my end, at least give me some pointers or things you'd like me to do, or things to check. For eg; if you need details from my Router or information. I can log into my HUB and do all that, but at least tell me what youd like me to check. The Silence on the post just feels direspectful to be honest. Them speeds im getting now are just abysmal. 5.79mbps upload speeds for £38+ pm on Vivid 100. Thats basically like getting 5% of a 100% service. Your expectation of a quick response on the community forum is misplaced. The main support for Virgin Media is the phone, 150 if you have a Virgin Media landline or 0345 454 1111. There are Virgin Media employees who operate here but they can take a week or so at times to respond. I presume you have checked Service Status for outages or problems in your area? For clarity... this is a user "help" forum where users (non-VM staff !) freely offer their experience and help to support other users solve their problems. People may not have replied on the last Saturday before Christmas for lots of reasons that escape me right now. If you are expecting that you will get some kind of instant response here from VM staff - well you wont. They do reply and are very helpful, but they reply in chronological order - oldest first - across multiple fora, and they have other things on their plates as well, - and so it is always a few days (at least) and usually more like a week before you will get an "official" response. Yes ive checked for problems in my area, There isnt any recorded. Also Rebooted the HUB etc etc, the usuals. Okay thank you for letting me know about the forum, regarding experienced users being helpful, thanks for the head up, I wasnt fully aware. I think ill have to try give 150 a call or something soon. In your browser’s URL box type in http://192.168.0.1 (or http://192.168.100.1 - if in modem mode) and hit return. On the page [there is no need to login] click on the “router status” icon at top right or the text at bottom middle - of first page up (depending on which hub you have) and then copy/paste 3 sets of data onto here - the downstream, upstream, & network logs. Don't worry about the formatting it can be easily read, but try to avoid using screen shots & don’t include personal data or mac addresses - blank them out. Others more qualified should comment whether this is causing your issues, but a few of your downsteam channels are above the recommended power level maximum of 10dBmv and the rest are quite high. As above, downstream is too high across several channels and upstream is maxed out. You'll likely need an engineer out. Il flag for staff but with the festive season approaching no idea how long it will be for a reply- might want to take a punt on the phones. As you noted.... "As above, downstream is too high across several channels and upstream is maxed out." But my question now is what actually causes this, or these types of things? Its just been very sudden, its never done this before.